Fill your home, deck, or patio with the elegant style of this freestanding plant rack. 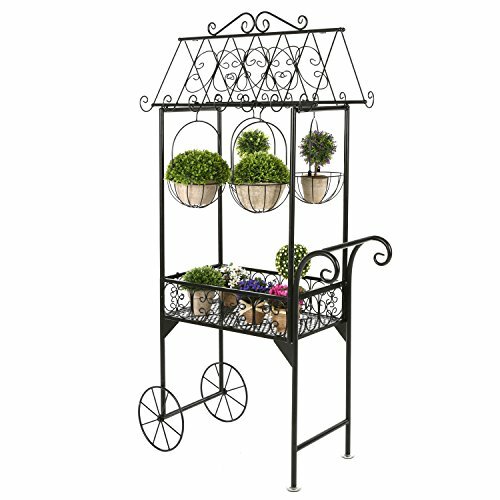 Made of sturdy metal with a classic black finish, this plant stand also boasts beautiful scrollwork accents and a Parisian-style trolley design with 2 wheels, a pushing handle, and a storage / display tray in the center. Above the tray, 4 half-sphere flower pots with handles and hook hang from the roof of the trolley to provide you with the perfect place to show off your favorite potted plants. If you're looking for an elegant and unique way to display flowers and other plants inside or outside your home, this trolley-style plant rack is the perfect choice. Approximate Dimensions (in inches): 33.75 W X 63 H X 18 D.
This large planter rack stands 63 inches tall and is made of sturdy metal and features a black finish and a scrollwork design. Comes with 4 plant holders with handles and hooks that allow them to hang from the top of the rack. Designed to look like a trolley with a handle, 2 wheels, and a storage tray in the middle.